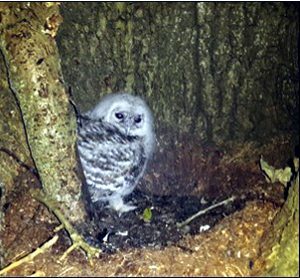 It was disappointing not to have a resident owl in the newly installed nest box, but at least we had enjoyed the trail camera shots of an owl exploring a potential site. In mid-March we blocked the hole, having expelled a squirrel family on several occasions. By this time of the year tawny owls will have chosen their nest site, and be well into their courtship cycle. Perhaps something will persuade them to use the nest box next year. Our son is a frequent visitor to the wood, and has developed his camping area under several large oaks. We were away during May and June, but he kept us updated on news from the wood. Towards the end of May there seemed to be a lot of owl activity around the camp. From the range of calls could there be young nearby? On 10th June he sent proof. 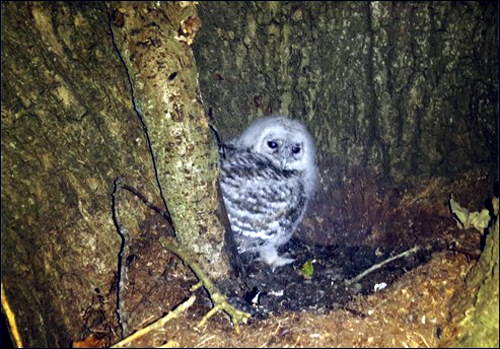 The picture showed a single owlet in the crook of an oak about 6 metres up, in the centre of his camp. We had put all our effort into finding the ideal spot for the nest box … secluded area, fine tree, right height etc, and the owl ends up nesting in the busiest spot in the wood. It also meant our son spent the next couple of weekends creeping around the campsite so as not to disturb! But who encroached on whose territory? Tawny owls generally prefer holes for nesting, but at times they nest in the open in old corvid nests, or in this case the secure crook of a tree. Such a site is more common in young woodland such as ours. We have no ancient trees or standing dead trees, and natural holes of sufficient size will be few and far between. Also, tawny owls tend to be traditionalists, and favour the same site year on year. In all probability owls have nested there for some years, and it was our son who had moved in. … and what happened to the owlet? It remained in the nest for two more weeks, with the parents busy feeding. By the 24th - it had gone, probably climbing away into the upper storey of the trees – but we don’t know. Owlets are of course more vulnerable to corvid attack in the open than they would be in a nesting hole, but there was no evidence of anything untoward happening. Anyway, we’ll be watching the box again this winter. The owls’ fleeting interest may grow, and they will probably do a better job than us at evicting squirrels.